One of the recent trends in interior decoration has been adding accent and decorative mirrors to help add character and appeal to a room. A mirror can add a sense of depth or reflecting lighting and improve the brightness and color of a space. A custom-designed mirror is the perfect way to add a unique touch to your home. Here are five great ways a mirror can complement any space in your home. As mirrors offer a near-perfect reflective surface, you can strategically place mirrors to help brighten a room or draw lighting to an area that is currently underserved by your existing lighting arrangement. The mirror will help reflect sunlight or other ambient lighting, or increase the impact of small or dim lighting. One great place to add a mirror is the dining room, says designer David Scott in a recent HGTV piece. The mirror offers a great way to amplify limited or candlelight, and helps create a more inviting and welcoming environment. Another great way to add a special new touch to a room is by installing an artistically framed mirror. Whether it serves as a centerpiece of your living space or accent decoration along other edges of a room, L.A. Frame Co. has more than 1,500 different frame styles and designs, allowing you to pick a color, style and texture that best suits both your existing décor and personal preferences. No matter the space you’re looking to add a new element to, we can help you find the right design for you. You can also add a subtle mirrored touch by putting your hanging photographs or artworks in a mirrored frame. These frames allow you to keep your family keepsakes or cherished decorations while adding an additional burst of brightness and stylistic panache, says Good Housekeeping. If you have many photos as part of a collection, you can also selectively add mirror frames to accent the photos that have the most meaning to you or that capture some of your most cherished memories. Adding the appearance of space is also a great use for mirrors. Large mirrors in a smaller room or confined space can give the appearance of openness or extended space, which can make a previously cramped or confined room look more inviting and appealing. Use a custom frame to make the mirror a special accent that fits the room, whether it’s a traditional square or rectangular design or a circular or other special and unique design. 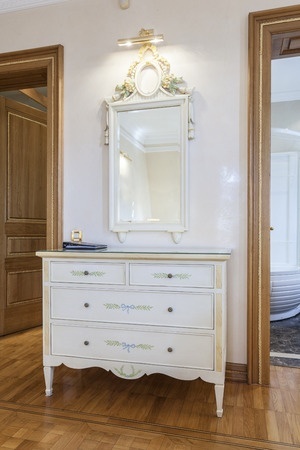 A final way to add a unique look is by grouping mirrors, says The Morning Call. Collecting together several mirrors in different sizes and frames as part of a larger arrangement can create a one-of-a-kind focal feature to a room. Conversely, two mirrors that are identically framed can help provide a sense of balance to a room, like matching his-and-her mirrors over a bed or above nightstands. Plus, these mirrors would also give you a quick opportunity to check your hair or do your makeup in the morning, too! With so many options to choose from, it’s clear to see why decorating with mirrors is one of the most popular trends in modern design. Find out more about creating a special and unique look for your home with mirrors by contacting us today.